SFR, Inc. Forum Index -> Artwork, stories, and other user contributed stuff. I apologize for my bad english and hope that everything will be understood well. I bought Dragondice a long time ago (when Dragondice was still very new). What I like (and i still like even today) especially well is the wonderful design of the dice and the idea to classify different dice as fantasy armies. 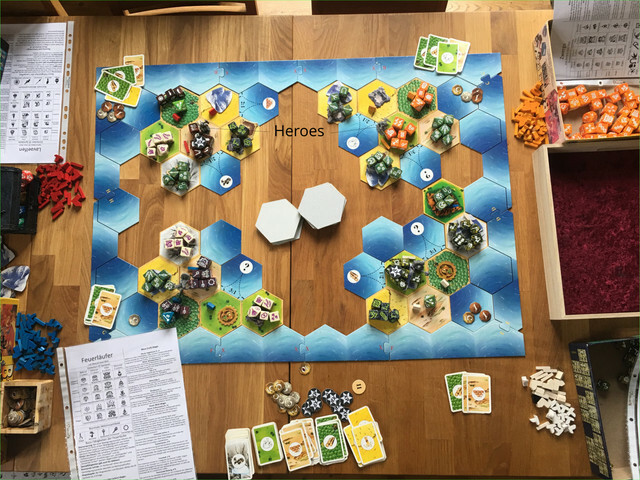 Over time (when I was still a teenager), I lost track of the game and rediscovered it by chance only a few months ago, when i met a long lost friend, which whom i played Dragon Dice™ back then (almost 30 years ago�). Then I started to think about Dragon Dice™ and that it's really a pity that this game never really made it to a breakthrough on the games market, but the idea with the dice is still as ingenious today as it was back then, and as far as i know no other game came with this great concept of the lot of wonderful dice. Then I started to remember why many did not spend a lot of time with the game back then. - The way to play is sometimes frustrating (own favourite dice get buried, etc.) and feels a bit strange, some got the feeling, against certain tactics (i.e. Turtling with a big army and crush all opposition with big attacks from all dices) they did not know what to do against. - The dragons are very nice, but too weak against big armies, and are almost always killed by them immediately. - Overall, the game is complex with all these spells and skills, but had still too little game depth or strategy variations available. I then read through the more up to date rules of the game and came to the conclusion that although much was being done (much well done refining) about the rules, nothing fundamental has ever changed, which means that for many players the game holds interest only for a certain amount of time. I felt a bit sad about it. Then it occurred to me that the Dragondice Dice were actually perfect for symbolizing the armies in a fantasy style risk-like game. Similarly, some sort of resource management would be nice for managing your own lands in a risk-like game, just counting the lands and grabbing bigger amounts of armies each turn feels a bit boring. So I sat down, took game mechanics from other games that seem to work well, and put them together for a new game. Since I have no way to design a completely new tabletop game, I had to resort to resources that are easily accessible and may already be available at home for many tabletop players. So an interested player does not have to buy everything completely new, but can possibly start playing immediately. Perhaps this set of rules can help to persuade old Dragondice veterans to dig up the game and give the dice a proper place in the tabletop game world. Of course all rules are free to discuss, and everyone is free to give ideas at how to further improve this new ideas to play with Dragon Dice™. The General rules are following, and i apologize for the walls of text, but i tried to explain everything as good as possible. Edit: fixed some of the most obvious grammar mistakes. The Amount of text is too high, i will give links to zipped PDF file with the Rules. Feel free to comment these Rules as you want. Mods: If there is another Way of linking to the files, feel free to modify.